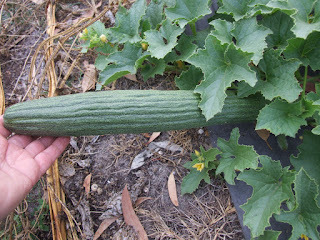 garden-larder: Are you sick of melons and tomatoes yet? Are you sick of melons and tomatoes yet? It looks like it is going to be scorching for the next week so I won't be getting anything done except watering - I see the water meter reader came round today so that is another bill coming soon. They never stop. I am a bit worried about the new seeds I sowed last week as they haven't had enough cool weather to get a root down if they have germinated so I hope they don't burn off as some of them were the last seed I had. Yesterday the Hamilton vintage car club came round to look at the farm as part of their monthly outing. There were about 40 members and they really enjoyed themselves. After the talk and walk they sat under the shady trees for a cuppa and chat - and I received a box of chocolates for my trouble. The easiest way to get on my good side is to give me chocolates, lol. As you know, I have a few of each of many melons in at the moment just to renew some of my old seeds and most of them are ripening now. Here is a snake melon. It is a true melon that looks and tastes like a cucumber, and use it just as you would a cucumber. Unfortunately one one hand pollinated fruit set but at least I will have some fresh seed for later. 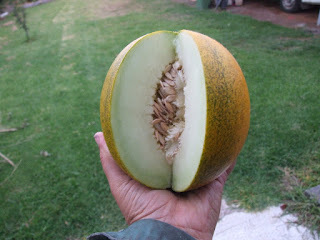 One melon that I have not grown for years is 'Collective Farm Woman'. I wasn't sure that the seeds would germinate as they were so old but I got a few plants. - and these seem to be easy to hand pollinate so I have plenty of seeds now. I like some of the Russian style melons with their firm, white flesh and apple-like flavours. Most of them also keep relatively well in the fridge which is a bonus at this time of year when I have melons coming out my ears. I only put a few tomatoes in this year. 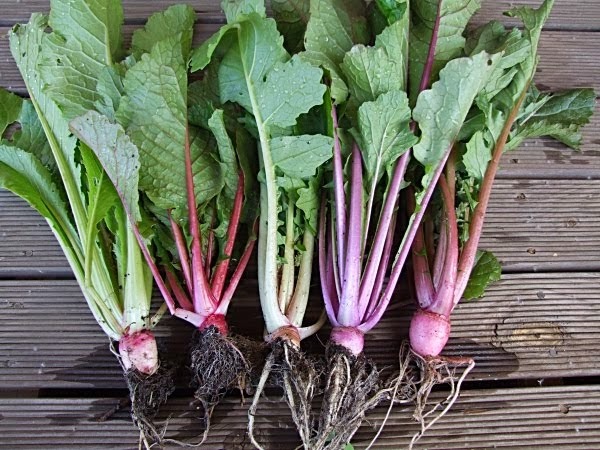 I haven't grown 'Juanne Flamme' before and since I am not impressed with its flavour I don't think I will again. These are orange, very soft fleshed and very mild with no acidity. I don't like them at all. The plants a quite productive though. I have to say the mice love them and any fruit on the ground are eaten as soon as they colour up. 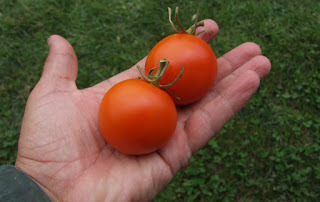 The 'Wild Currant' tomatoes are huge bushes this year and it is too difficult to get inside to pick the inner ripe fruits so I will wait a little longer till the outer fruits ripen. 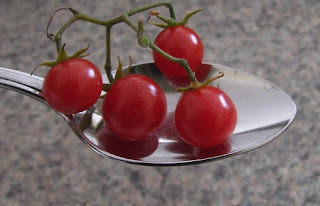 These are a favourite tomato with almost everyone. They are so sweet that you can just eat handfuls of them. I don't tend to bother with cherry tomatoes but this one is special. Thank you Rowan. Our car club enjoyed our visit and your hospitality last Sunday. You ceertainly have some interesting plants.